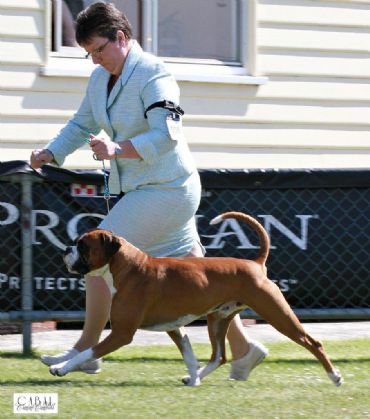 Mr Chats is an absolute joy to live with and the epitomy of the old saying that Boxers are the clowns of the dog world, he can always put a smile on my face with his antics. He has an absolutely superb temperament and love of life! He has it all, personality, charm and good looks! 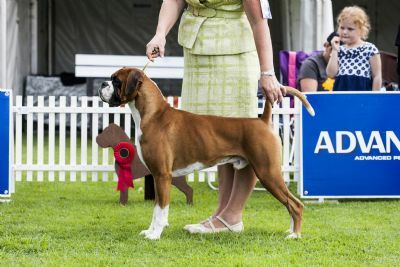 Chatty is a Best in Show winner and has multiple Class in Group & Class in Show wins. 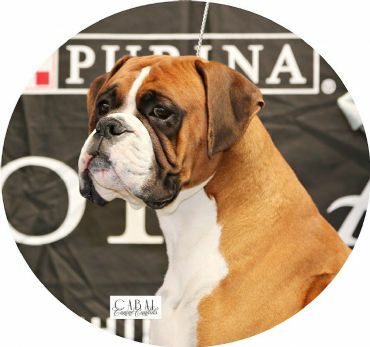 He placed third in a huge Intermediate dog class (20) at the 14th National Boxer Specialty. We thank Faye and David for their continuing support, it is greatly appreciated. We are so pleased to be able to have such a quality boy live with us. Chats has been Holter monitored with 0 VPB's. No ventricular premature beats or arrhythmias noted by Richard Woolley Veterinary Cardiologist.